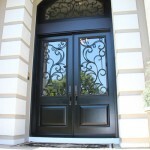 Saw this terrific article on Houzz.com about painting your front door black – complete with color swatches. 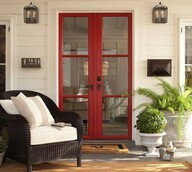 Look through this slideshow of pictures and suggested color palettes. Like! When replacing windows, there are three different replacement methods that may influence the type of windows you choose. How do you determine the method necessary for your home? The three replacement methods include full tear- out, insert, and sash replacement. Full Tear-Out is necessary when your windows are damaged beyond repair. Whether it be rot or storm damage, a full tear-out requires replacement of the window and the frame. Insert windows are used when the frame is in good condition, so the window is all that needs to be replaced. Although this method downsizes slightly the day light opening (glass size), generally, the interior trim and paint or wallpaper go untouched – a great application for historic homes. Sash replacement is simply replacing the sash, or the part of the window that you open. This is rarely recommended because structures move and settle over time. As a result, the sash may be square, but the opening is no longer perfectly square. This makes it hard to seal, causing poor energy efficiency. If you want more information, please contact one of our sales consultants at The Door Store and Windows.